Spinal motor neurons (MNs) are a highly specialized type of neurons that reside in the ventral horns and project axons to muscles to control their movement. Degeneration of MNs is implicated in a number of devastating diseases, including spinal muscular atrophy (SMA), amyotrophic lateral sclerosis (ALS), Charcot-Marie-Tooth and poliomyelitis disease . iPSC-derived motor neurons are valuable tools for biochemical analysis, disease modelling and clinical application of these diseases [2,3]. iXCells Biotechnologies is proud to provide iXCells™ motor neurons derived from normal donors or ALS patients. iXCells™ motor neurons express typical markers of motor neurons, e.g. HB9 (MNX1), ISL1, CHAT (Figure 1 and Figure 2), with the purity higher than 85%. Functional validation of iPSC-derived motor neurons has been done with neuromuscular junction formation (Video 1-4). iXCells™ motor neurons are available in both cryopreserved vials (2 million cells/vial) and fresh plate formats (12-well plate or 96-well plate). Most of the cells will express high level of HB9 and ISL-1 (Figure 1) after thawing in the Motor Neuron Maintenance Medium (Cat# MD-0022). And after cultured in the medium for 5-7 days, these cells will express high levels of CHAT and MAP2 (Figure 2). iXCells also provide customized differentiation service with your own iPS cell lines. Please contact us at orders@ixcellsbiotech.com for more details. Figure 1. 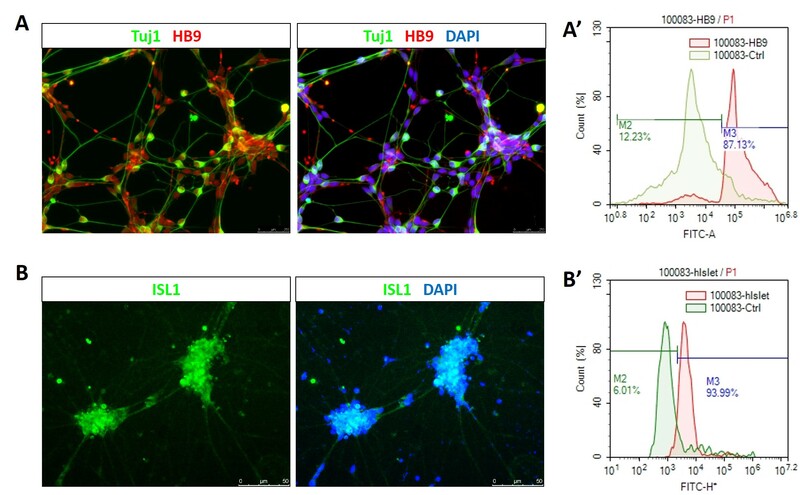 After cultured in Motor Neuron Maintenance Medium on the Matrigel-coated plates for 2 days, more than 85% of the iPSC-derived motor neurons express HB9 (Figure A and A’), and more than 90% of the cells express ISL1 (Figure B and B’). Figure 2. 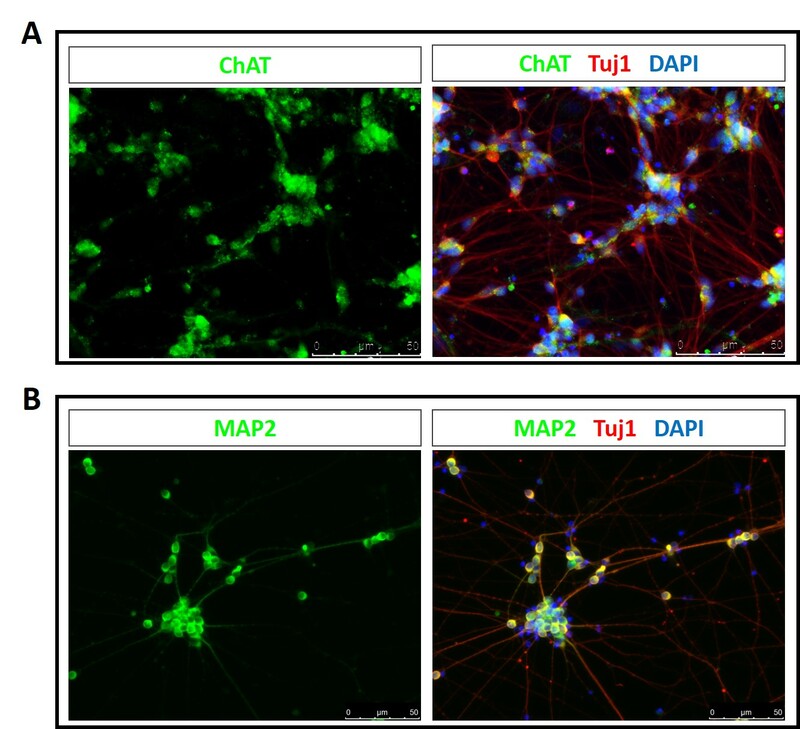 After cultured in Motor Neuron Maintenance Medium on the Matrigel-coated plates for 5-7 days, more than 85% of the iPSC-derived motor neurons express ChAT (Figure A) and MAP2 (Figure B). Figure 3. Co-culture of iXCells™ hiPSC-derived motor neurons with mouse astrocytes for 7 days. 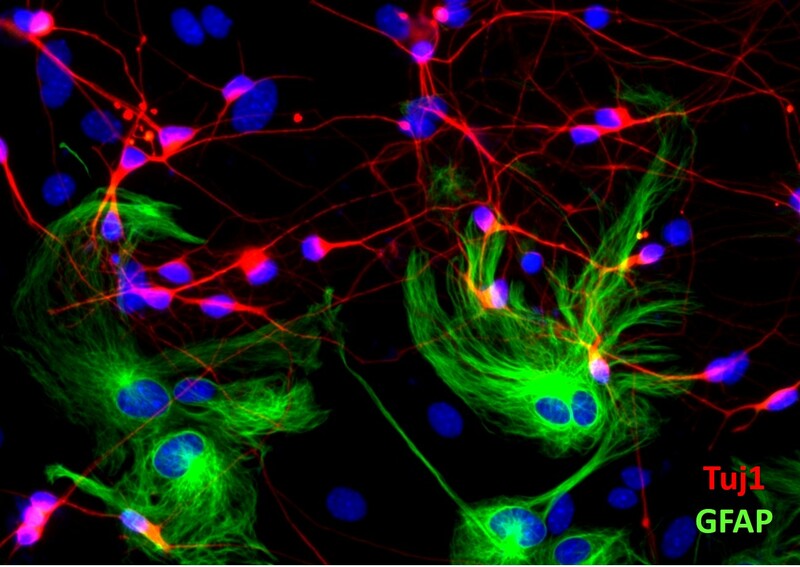 Motor neurons are stained with Tuj1, and mouse astrocytes are stained with GFAP. Brady ST. (1993). “Motor neurons and neurofilaments in sickness and in health. Cell. 9;73(1):1-3. Dolmetsch R, Geschwind DH. 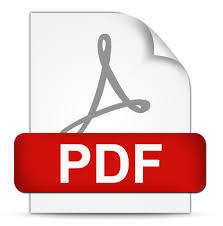 (2011) “The human brain in a dish: the promise of iPSC-derived neurons”. Cell. 145(6):831-4. Payne NL, Sylvain A, O'Brien C, Herszfeld D, Sun G, Bernard CC. (2015) “Application of human induced pluripotent stem cells for modeling and treating neurodegenerative diseases.” New Biotechnology. 25;32(1):212-28.